Fake Webcam - Play video as webcam, apply effects on webcam. 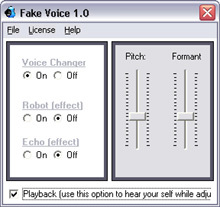 Voice changer changes your voice to male, female, old, young or simply some one new. Apply Robotic effect and speak like aliens. All-in-one solution to all your video needs. 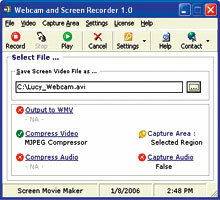 Supports AVI, MPEG, WMV, MOV, ASF, 3GP, MP4, DVD, VCD, SVCD and other formats. Converts videos from one format to other. Extract part of the video and save it in the same or different format.